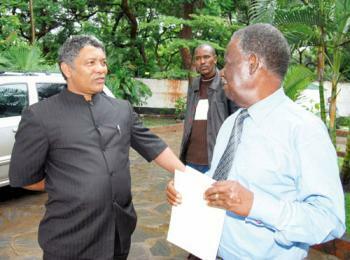 Given Lubinda is about to be expelled with the full blessing of President Michael Sata. But In his usual hypocritical method, Sata has phoned and assured foreign affairs minister Given Lubinda of protection from all forms of discrimination by fellow party officials state house sources have disclosed. Sata phoned Lubinda on Sunday 6th January 2013 at exactly 19:40 just after the decision to expel him was made. But Sata is feeling guilty and is trying to portray himself as a friend of Lubinda. Worse still, Sata and his ‘voicemail’ at State House think they can dupe the Zambian Watchdog and use it as a propaganda outlet. “President Michael Sata is against the intended expulsion of Mr Lubinda later this week; he has assured the Kabwata MP that he is the tourist attraction of the party and that no harm will reach him.” The source said. Continues Chellah’s email: ‘But state house sources have further revealed that the head of state is under serious pressure to have Mr Lubinda expelled by the PF kabimba led camp. ‘The source has further disclosed that failure to expel Mr Lubinda will send the ruling party into a deep rift of division. “It’s a double edged sword for the head of state and its giving him constant headaches, the looming divisions will really undermine national development and his capabilities to perform, that’s his main worry. ‘Kabwata Member of parliament Given Lubinda this week faces expulsion for alleged treacherous behaviour thereby undermining government operations’.